TV Strategies in Europe, Middle East and Africa – Market Update in cooperation with Broadband TV News with Cisco, Eutelsat, SES, Telekom Romania and VECTOR Technologies on Wednesday, 13 June 2018, Broadband Day on 14 June 2018 in cooperation with the Broadband Office of the German Federation and a keynote of the Minister for Economic Affairs, Innovation, Digitization and Energy of the State of North Rhine Westphalia. The traditional highlight of the German conference track, the Broadband and Media Summit, was on Wednesday, 13 June 2018. For the exhibition were registered more than 420 companies from 35 country. For the first time, there was a special exhibition area, the Smart Region Plaza, in cooperation with the Broadband Office of the German Federation. The Smart Region Plaza is a completely new format for meetings and showcases on broadband roll-out, with a special focus on practical questions for cities and regions. The new German government wants to cover the whole country with gigabit speed Internet by 2025 and plans to put up to 12 billion Euros in a special fund to help supply underserved regions with fiber lines. The new Smart Region Plaza offers municipalities, authorities, institutions, local network operators, civil engineering and service companies a compact, target group-specific option to present themselves. ANGA COM is organized by a subsidiary of the Association of German Cable Operators (ANGA) and has been supported by ZVEI (Satellite & Cable) for many years. In 2017, the event attracted 460 exhibitors from 37 countries and 19,000 participants from 80 countries. 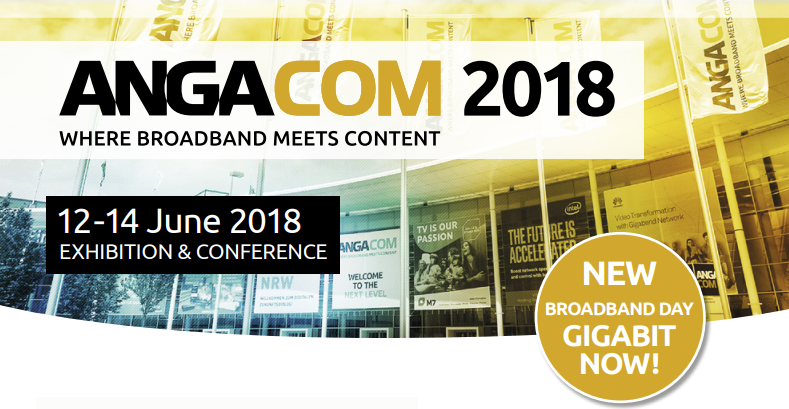 With a 50 percent share of international visitors ANGA COM provides a broadband and audiovisual media focused market place for network operators, vendors and content providers all over Europe.